Raleigh NC, 6/22/2014 – Captain EnergyPants made an impressive debut at STEM For Kids camp last week. EnergyPants took campers on an amazing journey of discovering energy. Children applied the engineering design process to design their own catapults and engaged in a friendly catapult war. 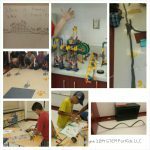 Afterwards, they collaborated to design and build roller coasters to experience potential and kinetic forms of energy. It was a matter of time before the hallway was filled with coasters taking their marble passengers through topsy-turvy turns. Captain EnergyPants had a lot more of adventure still in store. Campers delved into making work easy by creating simple machines. Soon, we had various creations demonstrating the five types of simple machines – inclined planes, wheels and axle, gears, pulleys and levers. Campers were proud of their creations – a bicycle, an elevator, a ramp, a ferris wheel and a balance. As a worldwide search for cheaper and cleaner energy continues, campers explored renewable energy sources and raced cars using wind energy. What was the best part of the camp? Campers were undecided and the votes evenly split among the various energetic activities. There are two remaining opportunities to participate in this camp in Raleigh this summer – Week of July 14th and the week of August 11. Interested parents can register online at www.stemforkids.net/registration.html. For program description, click here .